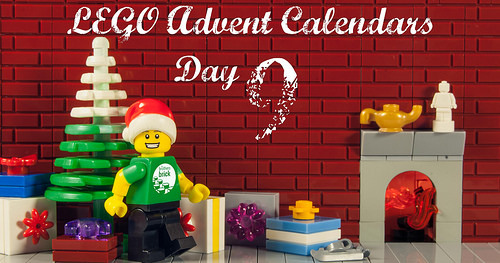 Welcome to Day 9 of our LEGO Advent Calendar countdown. 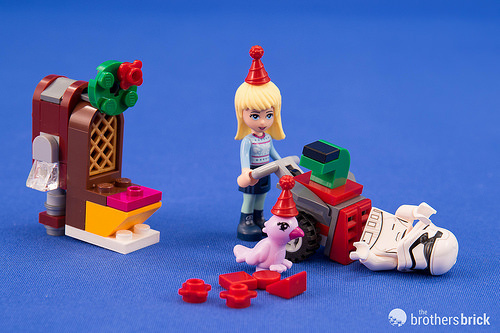 Each day, we’ll reveal the three mini-builds from the LEGO City, LEGO Star Wars, and LEGO Friends 2017 advent calendars along with commentary from our team. If you’re opening one (or more) of these advent calendars along with us, we’ve made sure the pictures and commentary on each day’s models will be behind a jump and posted in the evening every day, so we don’t accidentally ruin the surprise. What kind of design will we find in Day 9? 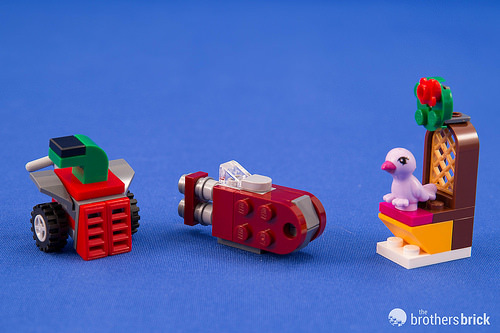 For Day 9, we have a snowblower from City, a mini Rey’s Speeder from Star Wars, and a lavender bird’s perch from Friends. Daniel: I really love the speeder model. Very accurate to 75099 Rey’s Speeder at this size. Any bets on how many wreaths we’ll end up with by the end? Alexander: Rey’s Speeder is my favourite mini-build so far! Very accurate and smart. Andrew: An utterly brilliant Rey’s Speeder, to be sure, but the snowblower is quite a lovely little build as well. Edwinder: Purple Patty feels a little tired today of flapping her wings and just deciding which will be her ride of the day… decisions, decisions. Luka: The Friends build has great pieces but is the worst build of the three, in line with the overall trend. Star Wars has a great design and City wins in the playability department once again. Dave: The City snowblower is great, though missing a few white studs to represent snow. Rey’s Speeder is brilliant, but again Friends phones it in with an uninspired perch for a lavender bird. Elspeth: The Friends build could not look any worse in comparison to the other great little models. I agree that Rey’s Speeder wins the prize for best model. Dave: Stephanie is getting a little irritated with how much the other advent calendars are better so she decided to take matters into her own hands. And who knew the speeder could combine with the bird perch to form a convincing toilet!? Andrew: The Friends team joins the Resistance and disposes of another First Order trooper! Elspeth: Just as well the purple parrot has accessorised with a Trooper-blood-coloured party hat… no one will see the splatter stains! Daniel: OMG! Nerf-milk just sprayed from my nose. I love the extra party hat on the Friends bird. Edwinder: My oh my… Purple Patty is a Rebel spy! I didn’t see that coming!